We're back again with another season of Football Manager and many have you already put finger-to-keypad to share with us your personal adventures in the game. We here at fmscout.com are very proud of the stories produced by our members and we show nothing but gratitude to those who take the time to tell magnificent tales of their experiences with the game. In this hub, you may find some useful links (as ScottT or myself post them) which may point you in the right direction when it comes to writing your own story. We'll also include milestones achieved by stories here, as well as Story of the Month winners. Unfortunately our Story of the Month & Story of the Year issuing has been a little inconsistent as of late, to follow with the fluctuation in interest in story-writing here. However, we feel that those who spend hours grafting their stories here deserve more. For the very first time, the winner of this season's Story of the Year award will win one free copy of FM20 as a prize for his work. The competition will be, as has been in the past, decided by a public poll. However, do not think you can cheat the poll, we have caught people out before on that! Also, we will be giving away a second free copy of FM20, for a storywriter selected by ScottT & myself who does not win Story of the Year. Neither of the free copies will go towards a staff member of the site, ruling out Scott & myself, in order to keep things as legitimately fair as possible. As for the actual structure of Story of the Month.... the poll for each month will appear on the first day of the following month, and will last 3 days. This is set in stone and seems the most practical way for us. ScottT, myself and our panel of judges will each nominate a selection of stories to make it on to the poll. Five stories will make the poll. If anybody on the panel makes it in the poll, then an additional slot in the poll will be provided to keep things fair for the public. This way, each poll will not be flooded by the judge panel. Story of the Year nominations will work slightly differently. 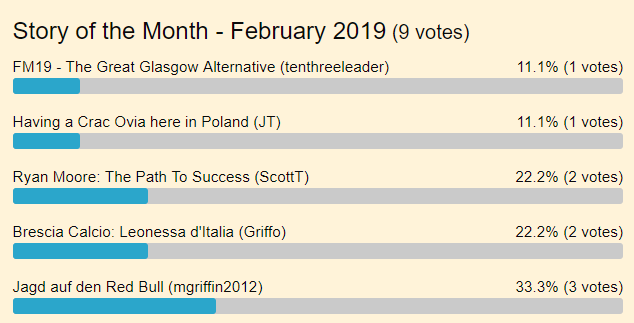 While this ruling may chance, the provisional qualification process is to either be a Story of the Month winner throughout the FM19 season, or to be one of three other stories (those who didn't win SotM) nominated to be on the poll. Story of the Year will take place before the Beta of FM20 is released. As we are always looking for suggestions on how to improve the site, especially the stories section of the forum, please feel free to tell us how you think we can improve things. Thank you, and good luck with your FM19 season! 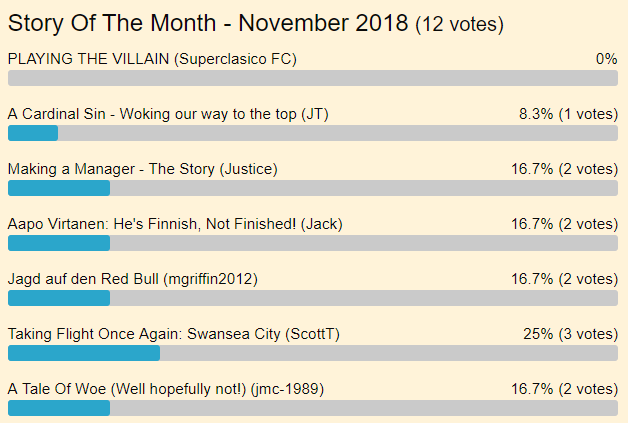 It is time to announce the winner of the first Story of the Month of the FM19 season. After a total of eight votes by the public, there was a clear winner with 50% of the votes. The winner was myself, Justice, with 4 votes for Making A Manager: The Story. I don't like to announce myself as the winner but the public have spoken and made the choice! 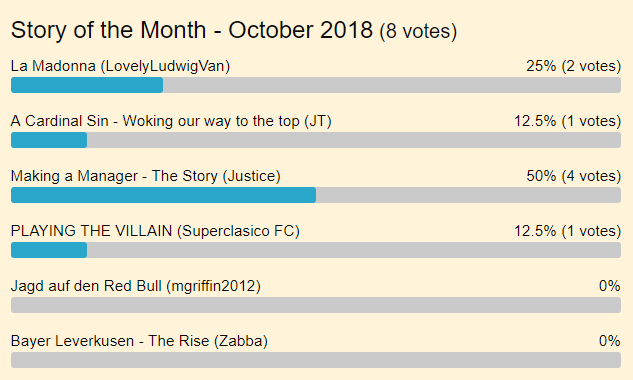 So, Justice becomes the first entrant into the Story of the Year competition (see details in first post of this thread), which will take place at the end of the FM19 season, which has a free copy of FM20 as the prize. If you would like to be in with a chance of winning a free copy of FM20, start writing today! Once again, it's time to announce the winner of the second Story of the Month winner for FM19. There was an increase in votes this month with twelve overall, that marked an extremely close vote. Four stories received two votes each, with the winner receiving just an extra vote. The winner of Story of the Month for November was, myself,ScottT. 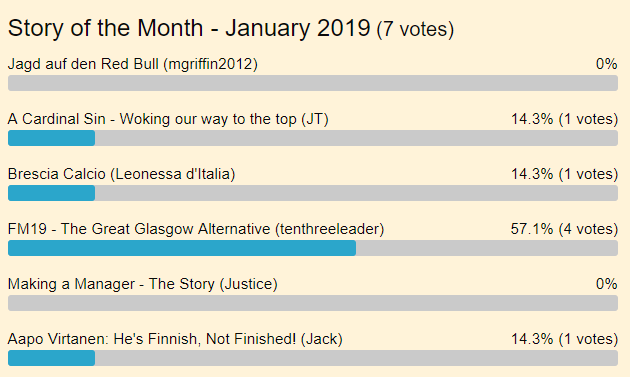 Similarly to Justice, I don't like announcing myself as the winner and I'm actually slightly disappointed given I believed their were some exceptional stories this month that deserved to win. However, I will be the second person to be entered into Story of the Year poll (for more details, visit the opening post). We encourage all to get involved and hope to see another highly competitive month of stories! 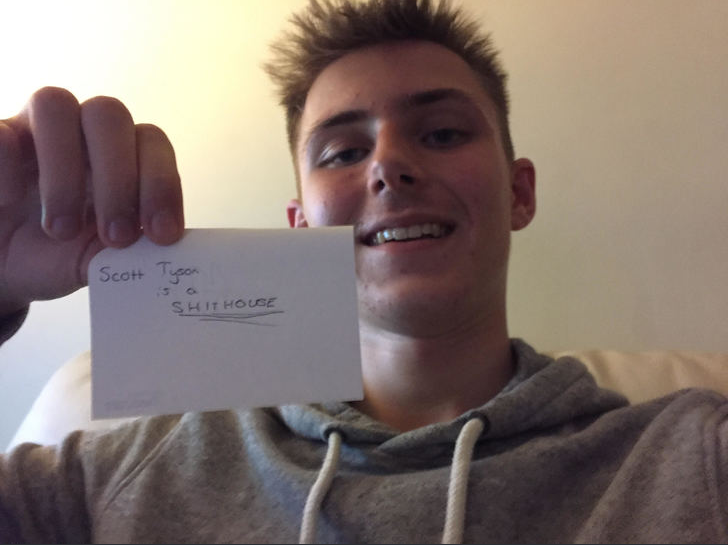 A truly remarkable achievement, congratulations to ScottT! The vote being so tight shows the quality of stories at the minute, well done to everybody involved. Congratulations ScottT a more than deserved award for a brilliant story! Your writing and presentation is incredible and an inspiration to all including myself! Looking forward to seeing where your story takes us! Is there not a story of the month to vote on this time? PlayForTheWin, there will be. I am just waiting for one set of nominations from one judge before I can put together a list of stories for the poll. It is time to announce the winner of the final Story of the Month award for the calendar year of 2018. There have been some brilliant stories over the past year but it has been mgriffin2012's excellent story with Austria Wien which has wowed us in the festive month. It has been his high standard of writing & presentation, as well as his incredible consistency, which has earned him the award. 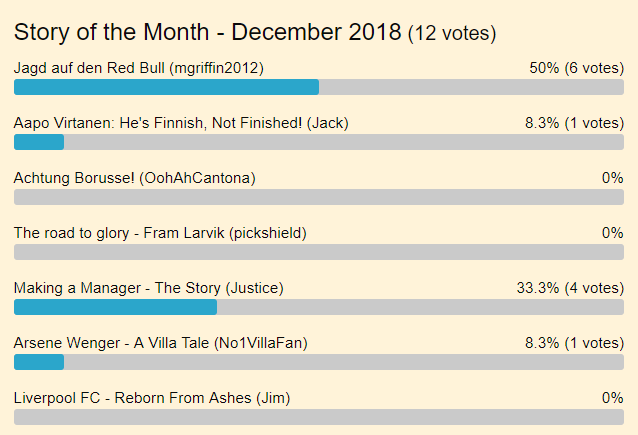 mgriffin2012 will see his story automatically placed in the Story of the Year poll at the end of the FM19 season. The beginning of 2019 brought with it the January blues. Thankfully, we are now over that hurdle. We recently saw the return of serial supreme-story executionist tenthreeleader, and the man labelled 'Keyboard Magician' by some (maybe just me) has risen to the top of the pops once more. tenthreeleader is your winner of the January edition of the Story of the Month. Congratulations tenthreeleader and thank you for an excellent month of story-writing! My cup runneth over Thanks, everyone! A rather delayed SOTM, in which I can only apologise for. We can now announce the winner of the February Story of the Month award, in which is mgriffin2012. A well deserved winner, who not only is a fantastic writer and asset to the site, but is arguably one of the most consistent writers we have here. He claims the award for the second time this FM year. Congratulations, mgriffin2012! We look forward to what you have in store for the remainder of March and beyond. Congrats mgriffin! You've certainly been the pace-setter over the past few months! 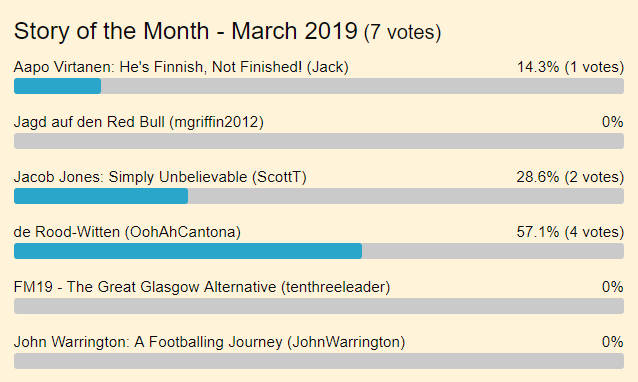 A big congratulations to OohAhCantona for winning the Story of the Month award for March. Has story, de Rood-Witten, has been a big hit in recent weeks and he picked up 57.1% of the overall votes to claim a much-deserved award. You are reading "FM19 Story Hub".